This is the first of a few articles that look at the different ridiculous, strange, and nonsensical diets people undertake in preparation for ‘summer bodies’. These have mainly been inspired by stories told by my friends, or about friends of friends as they have attempted to shake up their daily eating habits for something a little unusual. I have never really been one for dieting. As mother says, everything in moderation (plus half a pack of oreos per day) should usually keep the doctors away. However, it is not uncommon for people to attempt a diet in order to shed what was keeping them warm during the winter. For me, life is too short to worry too much about body shape, however with the rise of Instagram use, it seems inevitable that users are starting to compare their bodies to those of the models displayed all over the app. Keeping healthy is not a bad thing, and I’ll be the first to admit that biscuits and McDonalds are not actually what your body needs. However, as I undertake one day in the life of someone who follows a particular diet, I will be focusing mainly on how I feel and whether it is a sustainable way of keeping healthy, as opposed to focusing on the appearance aspect of the diet. This article was inspired by my friend who randomly told me about her cousin who only ate liquid food for a month. Sure, she lost a lot of weight, but as soon as she picked up the solid foods again, she put the weight back on. It seems as though many people have missed out on a key bit of information my dad told me when I was very young. Ansel, K. reports that eating below 1,200 to 1,500 calories a day will start to slow your metabolism down. As a result, when you start to eat a normal amount of calories, your metabolism isn’t as fast as it used to be, leaving you in a position that is perhaps worse than before you started the diet. Drinking liquid makes you lose weight because you are essentially consuming far less calories than you initially would. It cancels out a lot of food options, so there are no donuts, no crisps and no McDonalds (unless you have a vanilla milkshake). However, by only consuming liquids for weeks, you will be denying yourself essential vitamins that your body needs to function healthily. Aside from all the scientific stuff, I decided to try out a liquid diet for the day just to see how it actually feels, and whether I could even conceive of doing it for a sustained period of time. As always, I wake up feeling pretty hungry, but I was quite excited for a tasty smoothie to start my day off. After blending oats, a banana, frozen fruit, oat milk, and a little protein powder I was left with a large glass of thick liquid to sip away at whilst getting ready for uni. It was relatively filling, but by the time I got back from my lecture I was already hungry and had to make myself yet another smoothie, which helped me last until lunch. Once again, around 1-2pm my stomach was nagging at me to eat some food. So, I made some potato, celery and carrot soup (I promise it tasted nicer than it sounds). This was in fact pretty filling, but again - the hunger always seemed to crop up no more than an hour or two after eating! Getting hungry so often during the day is a bit of a nightmare when you’re solely on liquids. Spending £3 on a smoothie when out of the house seemed ridiculous when I could just have a sandwich for a little over a quid. I started getting pretty moody, because like Joey Tribbiani, I like my food. Feeling hungry is frustrating when you’ve got a busy day and you’re trying to concentrate on work. Neither tea or coffee helped ease the hunger. I mentally noted every fast food item my friends were eating that evening in order to add it to my shopping list for the next day where I would be free of the stupid liquid diet. The thought of eating yet another soup or smoothie made me feel sick. I started justifying all the reasons why mashed potatoes for dinner wouldn’t be so bad… it’s still kind of liquid… right? And anyway, I had to line my stomach a little better for dinner since Spoons was calling. So, I ate some mash, which turned into eating a veggie sausage, which turned into eating some cookies my friend bought from Tesco. There we have it, an inability to carry on that liquid diet for just a day. 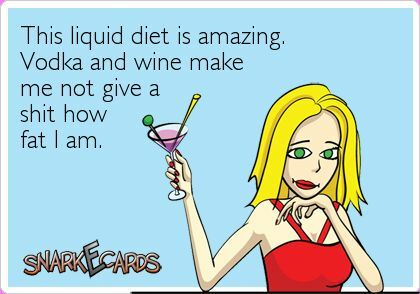 Admittedly, my self control is shockingly bad, but liquid diets are hardly satisfying by the time it gets to the evening. I can’t even conceive how this could have carried on the day after, and the day after that etc. Sure, liquid diets cut out calories but hunger is never paired with a good mood, nor the ability to concentrate well on work. For me, a summer bod is not as important as being able to function well on a day to day basis. Lastly, as you can probably tell from above, a liquid diet is likely not to be sustainable at all. My advice is that instead of making every day liquid day, maybe choose one or two days in the week to do it, or have one liquid meal per day. Sorted.